A Masterpiece of Modern Elegance! Here is your chance to live along one of the most picturesque blocks in the heart of the Clinton Hill! 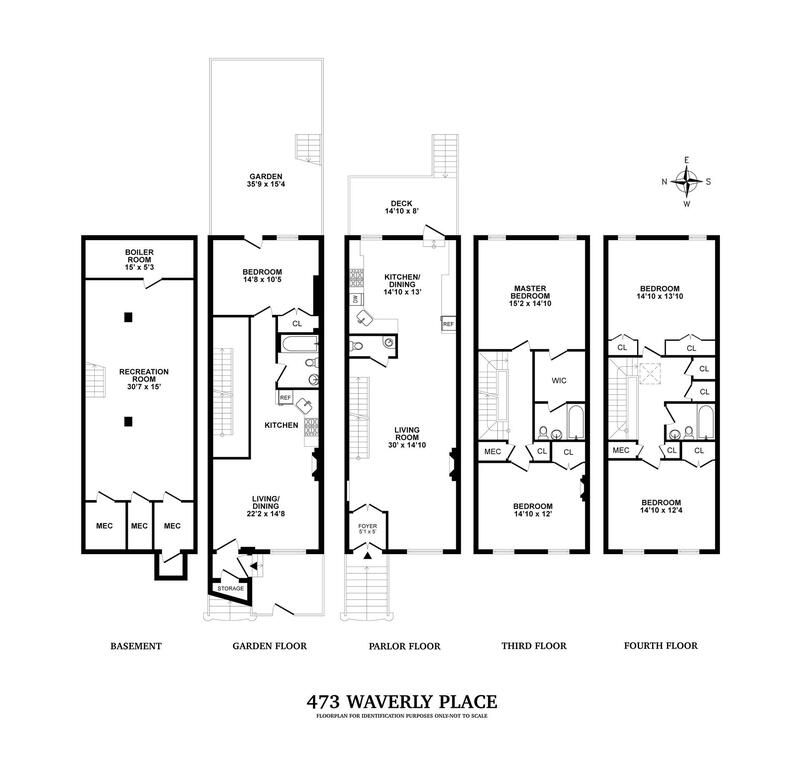 473 Waverly Avenue is a completely renovated, Two Family Brownstone, which exemplifies the artistic heritage and cultural fabric of this storybook neighborhood. Currently configured as a four bedroom (4BR) two and half bathroom (2.5 bath) owner's quadplex over a one Bedroom (1BR) one bathroom (1Bath) garden apartment, this home boasts over 3,500 square feet of living space. Exquisitely redesigned for comfort and with state-of-the-art technological adaptations and grand spaces, this important property establishes a new standard for refined living. The third in a row of eight two-bay Italianate Brownstones built in 1873 by developer Henry Strybing, the facade has been incredibly well preserved and retains all original architectural details including an arched entrance pediment set on foliate brackets, double entrance doors, intricate bracketed roof cornices and wrought-iron entrance railings. All salvageable original details have been carefully restored, and the home has been fully updated with a new roof, new deck, all new electrical wiring, central air and heating, new plumbing, and gorgeous white oak flooring throughout. As you stroll through the home, you will notice a wealth of state-of-the-art conveniences integrated throughout, wall-recessed audio/ visual interfaces (I-pads), ceiling speakers for the wireless Sonos sound system, Door Bird video entry/intercom, and Nest thermostats. A double entryway with glass-paneled doors welcomes you into the open-concept parlor floor, filled with a wonderful mix of old and new design elements. Highlights include 11 foot ceilings, three custom chandeliers, an 8 foot antique mirror in the foyer, full panel molding alongside the staircase and wainscot molding throughout the rest of the parlor, and a fireplace with original details including an imported marble mantle, accompanying wood balustrades and built-in decorative mirror. The large chef's kitchen boasts a hooded Wolf range, as well as incredible storage space with an oversized Sub-zero refrigerator, Sub-Zero/Cove dishwasher, and a large pantry all seamlessly hidden behind custom cabinetry. White subway tiles, Caesarstone countertops, and custom bronze hardware all complement the space. The parlor floors opens directly onto a full width-deck, with a staircase to the sun-drenched garden below. On the second floor, the elegant master suite overlooks neighboring townhouse gardens and features a custom chandelier, massive walk in closet, and spacious en-suite bath. In the front of the home, a gracious second bedroom retains an original fireplace with a decorative plaster mantel and a custom-fitted antique ornamental cast iron decorative insert. Upstairs, the third floor offers two additional oversize bedrooms with abundant closet space and an additional full bath, as well as a large skylight that illuminates the staircase below. A finished cellar/ recreation room rounds off this picture perfect grand home. An entrance through the front yard leads to the garden apartment, completely separate from the main home, boasting gorgeous hardwood floors, a marble fireplace, stainless steel appliances, full bath, and an oversized bedroom. The garden unit is perfect for an in-law suite or nanny apartment, and could easily bring over $33,000 per year in rental income. Both units have been configured to provide access to the beautiful private garden. Waverly Avenue is one of Clinton Hill's most well-preserved tree lined blocks. One is surrounded by the classic serenity of Brownstone Brooklyn, parks, and the energy of a culturally diverse community with superb dining, craft cocktail joints, home-made marketplaces, and destination hang-outs. Clinton Hill offers an abundance of transportation options, with a C train less than one block away, and the G, 2, and 3 trains also are in the vicinity.